If you experience misty or blurred vision when you wake in the morning, in one or both eyes, then you could very well have cataracts. The human eye is highly complex and it’s reasonably common for older San Diego patients to have cataracts. Aging is usually the main reason for cataracts. In the US, by the age of 80, more than half of the population have had a cataract of some degree, or have already undergone cataract eye surgery. The PBA estimates that over 22 million people in America, above the age of 40, have been affected by cataracts. With an aging population, it’s predicted that 30 million Americans will suffer from cataracts. Cataracts are a disease of the eye that blur the clear lens of the eye. As time progresses the cloudy parts become bigger and light is blocked from entering the eye, causing the foggy vision. To prevent the problem from developing further you can undergo cataract surgery in San Diego CA. The most popular remedy for people trying to restore their vision is the cataract surgery. Cataracts develop on the lens of the eye, so during surgery the lens is cut out and in many cases an artificial one is put in its place. We are here to help you if you are on the lookout for cataract surgery in San Diego CA. After you have spoken to us you will be able to make an informed decision, as we will inform you of the two main types of cataract surgery that are available. You will be able to decide what is best for you. Phacoemulsification, also known as small incision cataract surgery, is one of the more popular types of cataract surgery. A tiny cut is made on the surface of the eye and ultrasound waves are sent out across the lens from a small device. This makes the lens much easier to remove. Under extracapsular surgery a longer incision is made in the cornea, so the lens can be removed in one go. With both styles of surgery, the old lens is replaced with a new one, which the patient cannot feel. San Diego Cataract Surgery has an extremely high success rate, so it makes sense that so many people opt for surgery in order to improve their vision. Cataract surgery is also one of the fastest surgical procedures, taking less than one hour, so results are virtually instantaneous. The eye should be kept clean when surgery is completed to prevent infection. The lens takes a short time to heal and during this time there is a higher risk of infection. You should keep your hands clean in case you inadvertently touch your eye, and we will also prescribe to you eye drops to prevent any further complications. Cataract surgery San Diego is an effective solution to visual problems. 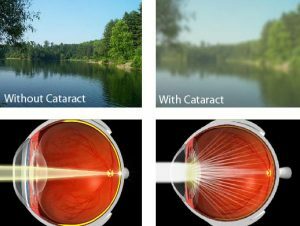 Symptoms from cataracts might be faded colors, cloudy vision and a glare around lights, so this is what you should look out for if you think you, or a family member, might have cataracts. Any of these symptoms might be an indicator of an underlying problem, but don’t worry as we are here to help. Sometimes as we age eyelid surgery may be helpful or even necessary. Our doctor performs blepharoplasty for our patients that would like to improve there vision for cosmetic or medical reasons.